Le Baroque's warm and friendly setting serves up a modern take on tradition. Experience an exciting menu, seasonal dishes, pizzas to eat in or take away, tapas, cocktails and more. Daily set menu at lunchtime (Mon-Fri). Phone : 04 74 00 26 40. Following in the footsteps of his grandmother Yvonne Chemarin and father Michel Chemarin and trained by top French chefs Paul Bocuse and Pierre Orsi, now it’s Bernard Chemarin’s turn to bring you a new gourmet experience. Phone : 04 74 07 07 07. Have a tasty pit stop at Le Bon Coin Café - Crêperie in the Old Town on the street to the fortress. No matter the time you can tuck into galettes, crêpes, salads and more. In summer you can dine al fresco in the shade of the floral terrace. Phone : 04 74 00 87 38. 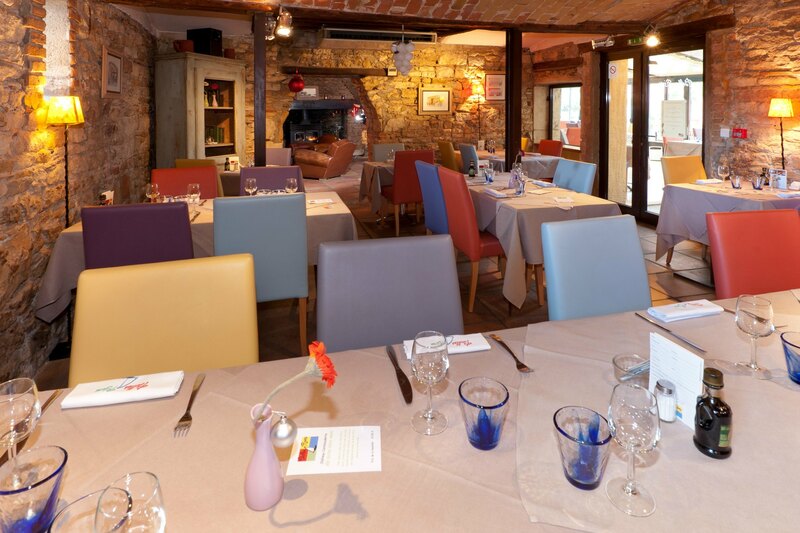 Feast on traditional dishes in the old town just minutes from the River Saône. As soon as the sun comes out you can enjoy frog's legs and whitebait on the terrace in a social atmosphere. Phone : 04 74 00 43 52.